Random Seasonality and more A.I. One can hardly read Twitter (or the newspaper for those that still do that) anymore without seeing a new story of how A.I. technology is driving new innovation. You most likely heard that Uber driverless cars went online yesterday in Pittsburgh, but another interesting development this week was that Project Wing, a unit of Google, is experimenting with Chipotle burrito delivery via autonomous drones at Virginia Tech. Watch: Google Tests Burrito Delivery via Drone at Virginia Tech I can only image kids laying out in the quad ordering burritos, only to have a drone come and drop off a barbacoa burrito (no extra meat, though, since that might exceed the weight limit on the drone). Clearly this is partially a marketing stunt by tying in Chipotle; it would never make sense to deliver burritos by drone any time soon – are there going to be hundreds of drones flying around campus, each with one burrito on them? Looking beyond the marketing aspect, Virginia Tech is an FAA approved test site and the experiments are being run by the some of the brightest technology minds in the world. Burritos aside, one application that comes into mind is healthcare and first responders. Imagine if as soon as a call comes in, a drone could be dispatched to deliver Narcan or an EpiPen. Or, in a pursuit, instead of a helicopter, there is just a drone following the assailant. Or maybe instead of people having to go to the pharmacy, important prescriptions will be “droned” directly to those in need. There are many applications beyond just the delivery of Amazon goods and such, and while still in its infancy, this technology may be coming sooner than most people realize. 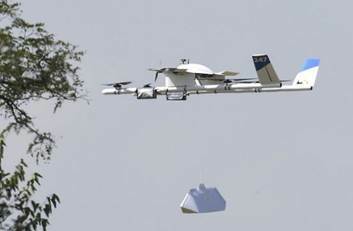 MORE: Will Drones be Delivering your Medicine?